Actress and author, mother and mental-health advocate, Mariel Hemingway grew up the granddaughter of Ernest Hemingway and the daughter of Jack and Byra Louise Hemingway. Dysfunctional is one way of describing the family challenges she faced growing up. Alcoholism and bitter fighting on the part of her parents; an older sister, Muffet, diagnosed with schizophrenia; another older sister, the model and actress Margaux, a victim of suicide at the age of 42 (her death 35 years after her famous grandfather’s suicide): Mariel Hemingway writes about her life in a new book called Out Came the Sun: Overcoming the Legacy of Mental Illness, Addiction, and Suicide in My Family (Regan Arts). She writes as her teen self in another new book, Invisible Girl (Regan Arts), which is aimed at young adults. March is Read Across America Month, and March 7th was Read Across America Day at the Children's Museum of Memphis. That was the day the Cat in the Hat visited the museum and where families could purchase Jennifer Holm’s The Fourteenth Goldfish, the young-adult title chosen by Literacy Mid-South as one of its two 2015 Books of Choice — the other book, for adults, is Mary Roach’s Gulp — for this year’s communitywide reading campaign. The week of March 9th was another component of Literacy Mid-South’s monthlong reading initiative. That was the week that the local organization, working with the national nonprofit First Book, distributed some 486,000 books — free books — to Memphis schools, churches, nonprofits, and organizations. To cap off the month, on Saturday, March 21st, Literacy Mid-South wants the Greensward in Overton Park to be a real mob scene. That’s when, from 11 a.m. to 2 p.m., Memphians are invited to another book giveaway and for some outdoor reading time. Thirty-five years ago, The Pinch, the literary journal of the creative writing department at the University of Memphis, was launched. But back in 1980, it was known as Memphis State Review. In 1988, the name was changed to River City. But now it’s known as The Pinch, and its current editor in chief is Tim Johnston of the U of M’s creative writing department. Ever wonder what it’d be like to travel cross-country in a gypsy wagon? Or what it takes to live in such a tiny house? And be a paper-maker and book artist in the digital age? The Thomases will be on hand to discuss book-making and to show examples of their work. 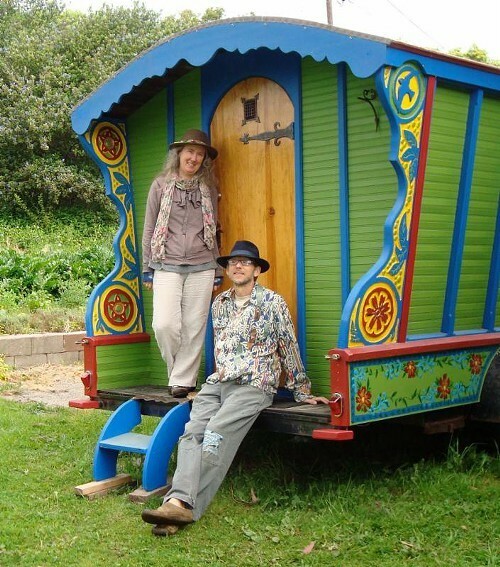 You’re welcome to tour the wagon, and you’ll be treated to the couple’s own jug-band music too. This week, The Booksellers at Laurelwood is hosting a pair of rhyming fiction writers, both of them with Memphis ties and both of them out this month with debut novels from front-ranking national publishers. Onsite at the Booksellers on Tuesday, March 17th, at 6:30 p.m., Moriah McStay, who grew up in Memphis and lives here with her husband and daughters, will be discussing and signing her young-adult novel Everything That Makes You (Katherine Tegen Books/HarperCollins). At story booth (438 N. Cleveland), on Wednesday, March 18th, at 6:30 p.m., Jamie Kornegay — the latest writer in the Booksellers’ “Literary Tastemakers” series — will be reading from and signing Soil (Simon & Schuster). The Elegant Universe: Superstrings, Hidden Dimensions and the Quest for the Ultimate Theory. And for young readers, Icarus at the Edge of Time. Heady stuff but written for a wide audience, and all four books are by physicist, best-selling author, and popular speaker Brian Greene of Columbia University.